**THIS NEEDS TO REFRIGERATE OVERNIGHT** I found this recipe on Dish Delish and thought it looked interesting. Unfortunately last night I was all excited to eat it and then read the recipe again and remembered it had to sit overnight, so I had to wait! I really like it though. 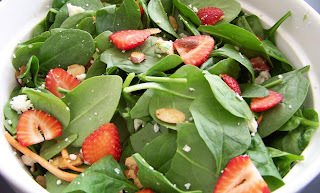 I tried it both as a "salad" on spinach leaves and also put it in heated tortillas and thought it was equally good both ways, just different. Definitely worth a try! *Cook rice as directed and cool. Boil chicken breasts until cooked. Combine all ingredients (except avocado and pecans) and refrigerate overnight. *Combine in blender and refrigerate overnight. 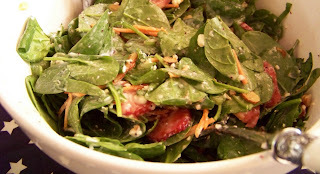 Pour dressing over salad and mix well until coated. Refrigerate 2-4 hours before serving. 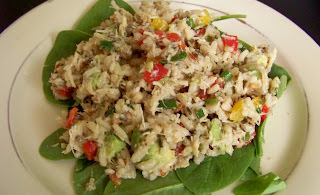 Immediately before serving, add diced avocado and pecans - mix well. 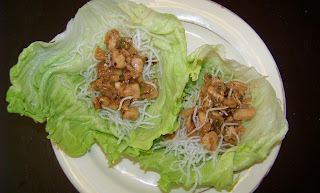 Serve on lettuce leaf or in tortillas. 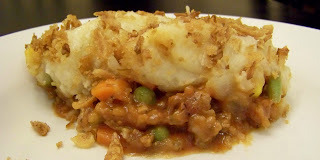 This is my favorite shepherd's pie recipe that I have found thus far. The fried onions are a nice twist. - Preheat oven to 375 degrees. Cook meat in large ovenproof skillet until browned; drain. - Stir in 1 c. fried onions, soup, water, seasoning, salt and pepper. - Spoon veggies over beef mixture. Top with mashed potatoes. - Bake 20 min. or until hot. Sprikle with remaining 1 c. onions. Bake 2 min. or until golden. This was actually my first "real" salad. I always say I'm not good at making deluxe salads, but I decided to go for it for our Memorial Day BBQ and really make a good contribution :-). I have had many similar salads and I thought mine turned out pretty well! This is another recipe from Kill the Gluten that I thought I'd give a try. It is easy and healthy and turned out well. I will add some more spices and possibly some onion next time around...there are many options to jazz it up a little bit, but this base recipe itself is pretty good too. 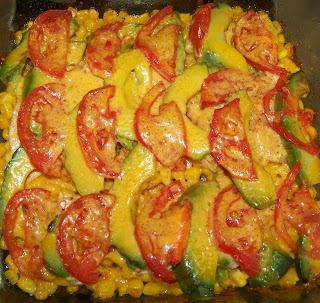 -Layer frozen corn (enough to cover bottom of 2-qt. 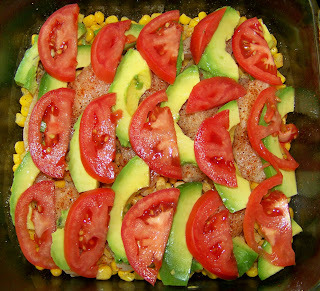 baking dish), chicken strips, avocado, and tomato. - Bake at 350 degrees uncovered for 30 minutes. - Sprinkle with cheese, cover, and bake another 30 minutes. I will probably add sliced onion next time and I seasoned mine with some chili powder and onion salt (which may not be needed when adding onion). I also topped with FF sour cream and served tortilla chips on the side. 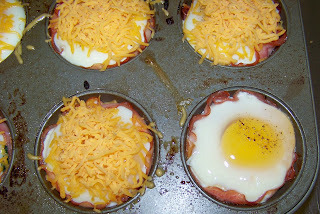 These actually are quite delicious but that is what Mike and Ella have named his breakfast specialty. - In a mixing bowl combine flour, baking powder, and salt. - In another bowl beat egg yolks slightly. Beat in milk and oil. - Add egg yolk mixture to flour mixture all at once. Stir just till combined but slightly lumpy. - In small bowl beat egg whites till stiff peaks form. Gently gold beaten egg whites into flour and egg yolk mixture, leaving a few fluffs of egg white. Do not overmix. 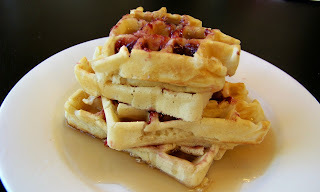 - You are ready to pour into your waffle iron! Step 1: Preheat oven to 375. 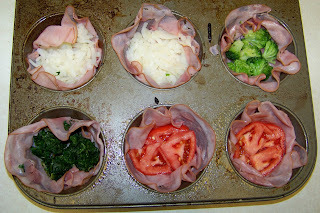 Fill greased muffin tins with deli sliced ham (to form little cups) and place fillings in bottom of cup. We tried the spinach and tomato they suggested on their site and also threw in some hashbrowns and broccoli. I think next time I'll add some diced onion or onion salt to give them a little more flavor. Step 2: Break 1 egg into each up and sprinkle with salt and pepper. Step 3: Bake for 10 minutes at 375 degrees, then top with cheese and bake 5 more minutes. Step 4: Let them cool down and enjoy. We all really like them...the tomato and hashbrowns were the favorites! 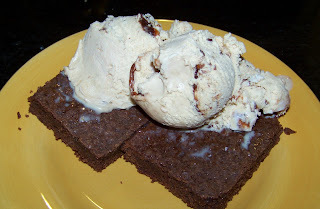 I adapted this from a Pampered Chef recipe and we have always really liked it...the girls especially LOVE it! * Preheat oven to 450 degrees. 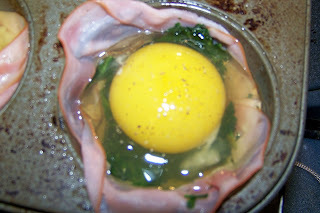 Melt 2 T. butter in microwave and whisk together with milk and eggs. - Put 1 T. butter in bottom of baking dish (I use my trusty 2-qt. square one, but if you have a circle it would look better) and place in oven until melted. - Reduce heat to 350 degrees and bake 10-15 more minutes until puffed and golden brown. * While the shell is baking, melt 1 T. butter in large sauce pan and stir in carrots, broccoli, potatoes and onion. Cook until veggies are tender. - Add lemon juice, chicken and cream of chicken soup. Stir in spices and continue stirring until heated through. 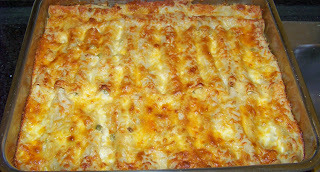 - Stir in cheese keep warm until the puff is ready. 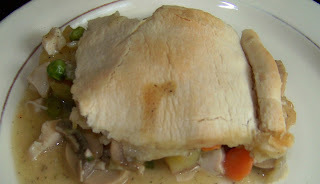 * Remove puff from oven and allow to cool and middle to fall, forming a shell. - Spoon filling into center of puff and enjoy. 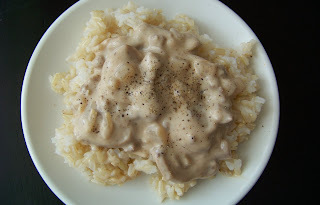 This is one of the first recipes I started making consistently when we got married. It's easy, really good, and uses beef too! - Cook meat in a large skillet with onion and garlic. - When meat is done stir in mushroom soup, sour cream, mushrooms and onion soup packet until well mixed. - Reduce heat and continue stirring until heated through. - Serve over rice or noodles. These were a lot of work to make (and a grocery budget breaker if you don't have any of the sauces like me...of course now I'll have them for a long time), but definitely worth it! I was nervous, but they ended up being super delicious and pretty dang close to what I remember at the restaurant! - Cover mushrooms with boiling water, let stand 30 min. then drain. Cut and discard woody stems. Mince mushrooms. Set aside. 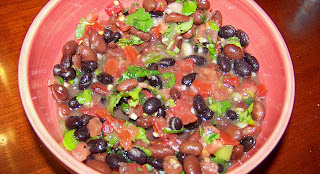 - Mix all ingredients for cooking sauce in bowl, and set aside. 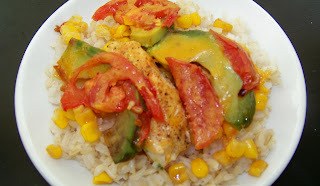 - In medium bowl, mix ingredients for chicken marinade and add chicken. Stir to coat chicken thoroughly and let sit 15 min. to marinate. - Heat wok or large skillet over medium high heat. Add 3 T. oil (I skipped the oil), then add chicken and stir fry for 3-4 min. Set aside. - Add 2 T. oil to pan (I used 1). Add ginger, garlic, chilies, and onion; stir fry about a minute or so. - Add mushrooms, bamboo shoots and water chestnuts; stir fry an additional 2 min. Return chicken to pan. Add mixed cooking sauce to pan. Cook until thickened and hot. 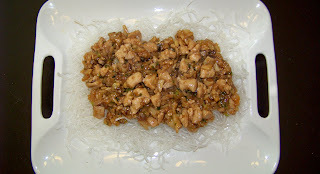 - Break cooked cellophane noodles into small pieces, and cover bottom of serving dish with them. Pour chicken mixture on top of noodles. Spoon into lettuce leaf and roll. Enjoy! This was one of my favorite meals growing up! I used to request it for my birthday dinner sometimes I loved it so much :-). 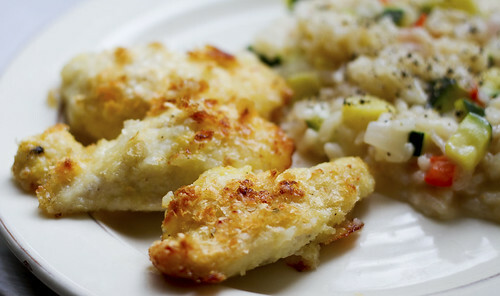 It's like an oven fried chicken, but since you use instant potato flakes as the "breading", it's gluten free! Our kids love it! - Preheat oven to 350 degrees. Slice butter and place along bottom of glass baking dish. - Put dish in oven until butter has melted and coated bottom of pan. - While butter is melting, beat the 2 eggs in one bowl and in another bown combine potato flakes, Parmesan, garlic salt and pepper. - Dip chicken pieces first in egg and then coat in potato flake mixture. Place in buttered dish side by side. - Bake uncovered for 25-30 minutes (until chicken is cooked and flakes are looking golden and crispy on the edges). Mike's contribution to the men's Mother's Day dinner last night was his delicious made-from-scratch brownies. I love that he can bake tasty treats :-)! - In a medium saucepan melt margarine and choclate over low heat. Remove from heat. - Stir in sugar, eggs, and vanilla. Beat lightly by hand just till combined. Stir in flour and nuts if using them. - Spread batter into an 8x8 pan (Mike likes to use a 9x13 to make them thinner). - Bake at 350 degrees for 30 minutes. Cool on a rack and frost if desired. Sorry for the not so great picture - don't let it deceive you though, this was delicious. I would have taken a picture before I cut into it because it was semi-pretty and would have been really pretty if #1 I had a round baking dish (I used a square) and #2 I was a little better at "fluting" edges. - Place carrots, potatoes and turnip in a large saucepan; cover with water. Bring to a boil. Reduce heat; cover and cook for 10-15 minutes or until tender. - Meanwhile, in a small saucepan, melt butter over medium heat. Stir in flour until smooth. Gradually add broth, thyme, salt and pepper. Bring to boil; cook and stir for 2 min. or until slightly thickened. 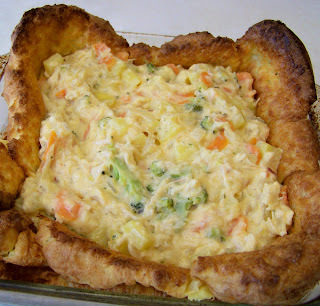 - Drain vegetables and place in a large bowl; stir in white sauce, chicken, peas, mushrooms and onions. Transfer to a greased 2-qt.round baking dish. - Place pastry over filling; trim, seal and flute edges. Cut slits in top. Bake at 375 degrees for 25-30 minutes or until the crust is golden brown and filling is bubbly. Chop tomatoes and green onions. Coarsely snip cilantro and combine w/ tomatoes and green onions. Press garlic into tomatoes. Add lime juice, then beans, sugar, salt and pepper. Cover and refrigerate 1-2 hours to blend flavors. Serve with warm Toasted Cornbread Slices (I just use tortilla chips – the little bowl/scoop kind work well). 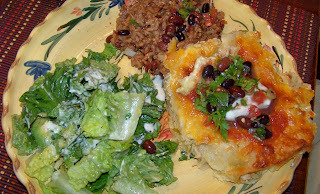 Many of you have eaten these enchiladas at my house, but they are mom's specialty. They are more work than I like to spend for a typical dinner, but they are always a big hit for company! - Pour cream in bowl and mix in garlic salt. - Mix green chilies, chicken and chopped onion together in another bowl. - Pour thin layer of cream to cover the bottom of baking dish (9x13). - Heat oil in frying pan and get tortilla soft in it (set on paper towels to absorb excess oil). - Dip tortillas in cream, fill cneter with chicken mixture, cheese and some green enchilada sauce. - Roll tortilla and place, seam down, in dish. - Pour remaining enchilada sauce and cream over top. - Bake at 350 degrees for 20 minutes, covered. - Sprinkle remaining cheese and bake, uncovered, 5 more minutes. We refer to this as DR Stuff because it is so much easier to say than it's proper name. I must admit the first time Mike made this years ago I was quite skeptical, but it is actually delicious...I promise! 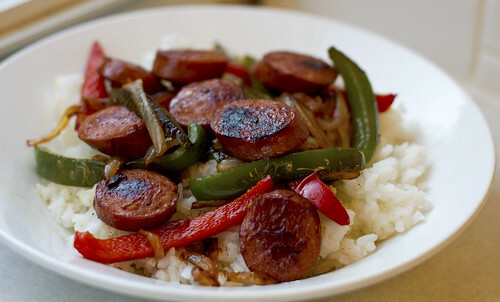 - Saute salami, peppers and onion in pan until onions and peppers are cooked. - Stir in tomato sauce until heated through. 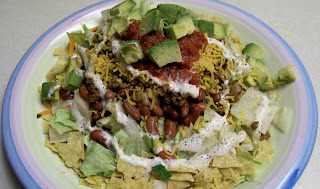 No, you don't really need a recipe to make taco salad, but everyone has their own version so I thought I'd post mine. This is the one salad Mike considers an actual meal.